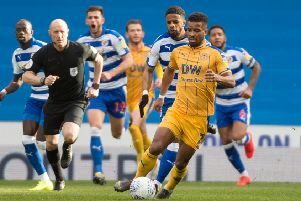 Chey Dunkley is hoping some boxing training during the international break will help Wigan Athletic punch their way out of the relegation fight. The Latics squad used the break in fixtures to hit the bags at Blundell’s gym in Wigan. And Dunkley – who was pictured throwing some decent haymakers against local pro James Moorcroft – knows the gloves are off now with just eight games to go. “I do enjoy a little bit of boxing to be fair, and it was a nice day we spent there,” he told the Wigan Post. “It’s great to have a variety in your training, it keeps everyone on their toes. “It’s good for team morale, mixes things up a bit, and that’s great for the mood in the camp. “The ‘proper’ boxers were pushing us as hard as they could, and there were times we were crying out for a rest! When asked whether there were any budding Floyd Mayweathers in the squad, Dunkley broke into a smile. “Haha, I’ll be modest and saying nothing!” he said. “There were lads who could throw decent punches, and those who couldn’t. Latics will step out of the ring and back on to the field this weekend with Brentford visiting the DW Stadium. They start the day three points clear of the drop zone, looking to make amends for the 2-0 defeat they suffered at Griffin Park back in September. “Brentford are good side, very possession-based, like to keep the ball – which they showed at their place,” Dunkley acknowledged. “At the time we were thinking they would be up there contesting for the promotion places, they were that good. “We were flying as well to be fair, but this is a tough league and it goes to show you can’t take anything for granted. “But we’re at home, we’ve been much better at home than we have been away, and hopefully we can capitalise on that this weekend. “Facts are facts – we are a strong side at home, and that should give us all the confidence we need. “We’ll be prepared after a fortnight off and we’ll be raring to go. “If we play like we did against Bolton, we should be all right. “We know we can score goals when we’re on song.